All home air filters use some kind of rating to tell you how fine of particles they’ll filter out. MERV – or Minimum Efficiency Rating Value – is the standard that most companies use. Notice I said most. 3M decided to make things difficult by coming up with their own rating system. I’ll let it slip since they invented Post-It notes. The good news is they both use a number system where a bigger number = finer filtration. Now, I’d avoid 3M’s “Basic Pleated” MPR 100 filter. FilterBuy doesn’t even make a filter with a rating that low. I wouldn’t trust the MPR 100 filter to keep anything but the big dust particles out of your air supply. The next step up is a MERV 8 from FilterBuy or MPR 300/600 from Filtrete. If you’re not particularly concerned with air quality, these are just fine and come at a reasonable price. If you do want to minimize issues with allergens, airborne illnesses, or pet dander you’ll want finer filtration. Consider the MERV 11+ and MPR 1200+ options. There’s a ridiculous number of sizes available for HVAC filters. They vary in height, width, and thickness. While there are several more standard sizes, you’ll need to check what’s currently installed in your home to be sure you’re buying the right thing. Take a look at the side of your current filter(s). You should see something like 16x25x1 printed on the side. These three numbers represent the height, width, and depth in inches. It’s good to know that most filters are actually a little bit smaller than they say – usually by about half an inch. This is so small differences in the size of cold air returns won’t keep the filter from fitting. Once you’ve made note of the size and have an idea of the MERV or MPR rating you’re shooting for, you’re ready to pick a filter. Bronze is the entry-level filter from FilterBuy. 3M makes a filter a step below their MPR 300, but I don’t recommend it for anyone. The MERV 6 and MPR 300 are both pleated filters with filtration adequate for basic household dust removal. FilterBuy’s pricing doesn’t really make sense on the Bronze filter. It’s no cheaper than the next step up, so I wouldn’t bother with their Bronze series. Speaking of price, the Filtrete MPR 300 incredibly cheap. If you purchase by the six pack, the Filtrete is over $2/filter cheaper for common sizes. Again, these filters won’t filter very fine particles, but they are very affordable if cost is the primary concern. Better to replace an old filter with one that’s lower rated than not replace it at all. Moving up to the Silver series from FilterBuy or MPR 600 will help catch more fine dust particles as well as pollen. This is one of the more popular levels of filtration sold, but that’s largely due to the low price and not the performance. That’s not to say it’s a bad choice. 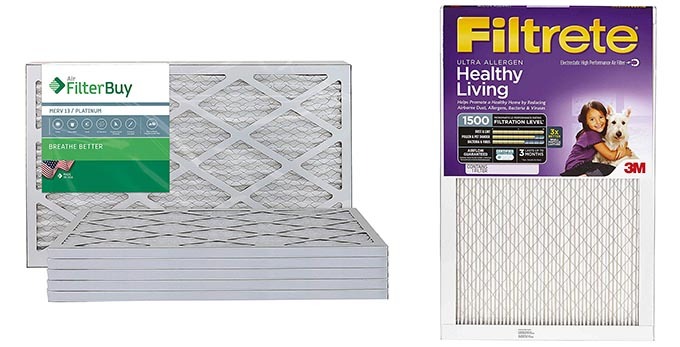 In fact, these filters are what I’d recommend for most households with no young children and no allergy and respiratory issues. They’ll perform well in these cases and reduce dust accumulation throughout your ducts and household compared to a MERV 6 or MPR 300 filter. Both FilterBuy’s Silver and Filtrete’s MPR 600 are pleated filters with synthetic filter media. Both brands use “beverage board” frames which are cardboard designed to still be strong when wet – good for very high-humidity areas. In terms of quality and performance, either is a good pick. FilterBuy has really reasonable pricing on their MERV 8 filters. 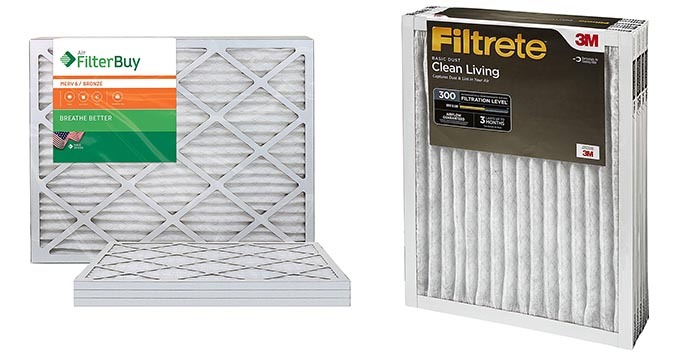 Expect to save about $2 per filter over the comparable Filtrete option. Let’s look performance when you move further up in filtration level. The FilterBuy MERV 11 or Filtrete MRP 1200 are a much better choice in homes where air quality is a concern. Unlike MERV 8 or MPR 600 filters, these will go a long way toward reducing allergens such as pet dander in your home. Not only that, they’ll trap most odor particles. Whether there’s a smoker in your home, or you really like to sauté fish, these odor particles will get trapped in the filter and cleaned from the air rather than circulated throughout your rooms. Which one to choose between the two brands? 3M’s filter tends to shed a bit of its carbon coating. Additionally, the FilterBuy MERV 11 seems to have more of an impact on odor reduction if that’s a concern for you. Finally, price. 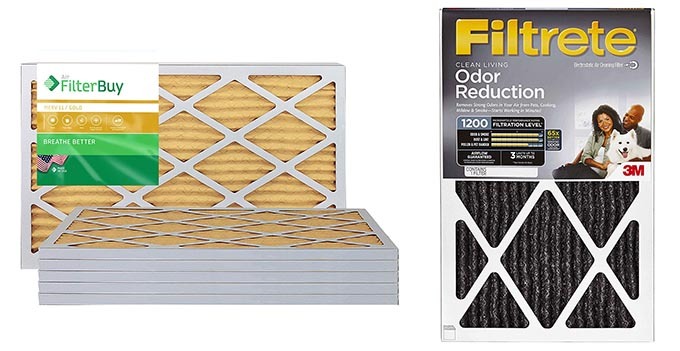 Filterbuy sells their filters in a 6-pack and offers a big discount when compared to Filtrete’s 2-pack. With around a $5/filter price difference, I think there’s a clear winner here. This next step up is what I’d recommend looking at if you want to reduce the spread of germs in your home. In addition to being great for blocking odors and allergens, the FilterBuy Platinum and Filtrete MPR 1500 will stop both virus and bacteria particles. Homes with newborns or those affected by autoimmune diseases should consider filters with these ratings as a minimum. You may have heard that using a high-MERV filter can reduce airflow. However, studies have shown flow rates don’t necessarily get lower as the MERV number goes up. More important is choosing a good brand and changing the filter regularly. Picking a low quality filter mean less airflow despite not filtering as well. Pressure drop with FilterBuy’s MERV 13 and Filtrete’s MPR 1500 isn’t significantly greater than that of the MPR 8 and 11 filters. So, if filtering very fine bacteria and virus particles is important to you, most HVAC systems should safely handle either brand’s filter. Just be sure to change the filter regularly. It’s going to catch more and therefore will clog up sooner. Does one filter stand out between the FilterBuy Platinum and 3M MPR 1500? As with most of the higher-performing filters, quality is similar. However, price is not. FilterBuy again offers a 6-pack with a nice discount. In the case of the MERV 13 / MPR 1500 filters, 3M’s filters cost over twice as much per filter, which can really add up over time. At the top filtration level, 3M offers a line of products while FilterBuy does not. In most cases, these are overkill for the home. The MERV 13 or MPR 1500 filters will meet the air quality needs of most households. Who might consider the MPR 1900, 2200, or 2800? These filters are best for those with serious respiratory problems or autoimmune diseases. As air quality directly affects quality of life, spending a little extra on the best filters can be worthwhile. Air pollution and soot from burning candles is also filtered at these levels. 2200 and beyond will filter exhaust particles. At the top level of home product 3M offers, the 2800 is said to filter “ultrafine particles.” As far as I can tell, ultrafine particles in their terms would be those around 1 micron in size. While most contaminants are larger, they do vary in size, so I imagine this could add in catching the smallest of virus, bacteria, and air pollution particles. There’s about a $9/filter price difference between the 1900 and 2800 filters when bought in a 2-pack. Which you choose depends on both your budget and just how critical your air quality is. In the above cases, every 6 months is about right for your filter replacement. Otherwise, replacing every 1-3 months is a good idea to avoid extra wear on your HVAC system due to blocked airflow. What you ought to do is to get on a schedule for replacing your filter. So should you do it every month? Every 3 months? Here are some recommended schedules I’ve come up with. Now, these are just some rules of thumb, but there’s more to consider. Oh, and if your filter looks dirty next to a new one, it is dirty. In fact, that usually means it’s beyond the point it should be. Get it replaced. Even more important than selecting the best filter is to make sure it’s installed right (visual guide here). Before getting started with your filter change, make sure your system is turned off at the thermostat. We don’t want any unfiltered air going through the cold air return. Most filters are behind an access panel or grate. This cover can be removed by turning tabs, removing screws, or in some cases simply pulling away the panel. Once you’re in, set the old filter aside. Check that the size listed on your new filter matches what’s printed on the old one. Now that you’re ready to install the new filter, be sure to check its side for a printed arrow. This arrow points in the direction the air should flow. It should start at the grate or access panel and point toward the direction of the furnace or AC unit. If installed backwards, air flow will be restricted and your air handler will need to work harder. Also important is making sure there are no gaps around the filter. 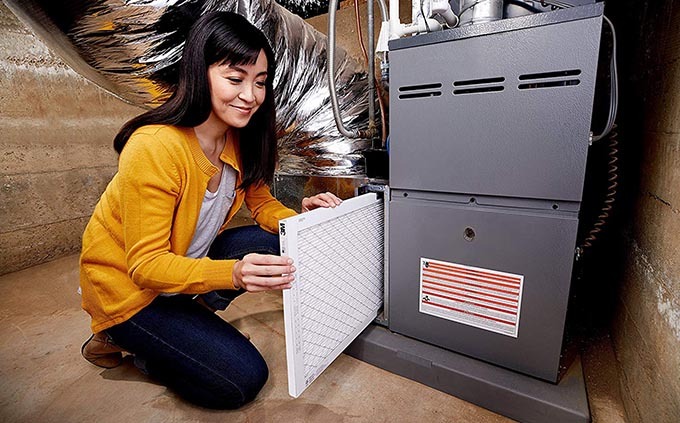 You’re looking for all of the air to pass through the filter before it gets to your heater or air conditioner. If there are gaps, the filter can’t do it’s job properly. If there’s space in between, make sure the new filter isn’t bent. If you’re still seeing gaps, it’s a good idea to contact an HVAC repair company to fix it. They might fit a gasket around the filter or reshape the opening. Once everything is correctly in place, make note of the date you replaced the filter. What I like to do is set a reminder on my phone’s calendar so I get alerted when it’s time for a filter change. It’s all too easy to forget to change the filter on time and make your system work harder than it needs to. Stay on top of using clean, well-made filters. It’ll both protect the investment in your HVAC system and improve your air quality. If you’re looking to further clean your air, look into an air purifier for your bedroom or living room.